Winter hit Montpellier this weekend with a blast of parky weather and the sort of Arctic wind that finds the only flaw in your outer layers, darts in, and chills you to the bone. Within 24hrs we'd gone from an Indian Summer to full on Winter. What happened to Autumn this year? Maybe it'll pop back in a few days. My DB and I decided to attend a book reading on Saturday. I had read about it on SFN and as we couldn't go to Frontignan to look at a car (for his daughter) because, of course, garages are not open on a Saturday afternoon, we had ample time. The sun was shining, and still being in Indian Summer mode, we went in by motorbike. We regretted this as soon as we set off because it turned out to be bloody cold. Thankfully Le Bookshop was lovely and warm. I hardly ever go into Montpellier to browse so I haven't been there very often, but it's a lovely welcoming shop that serves tea and cakes that you can enjoy while you read a book or two. The author was Lynn Michell who was there to read from her book 'White Lies'. She lives near Clermont l'Hérault so is very much a local author (her blog describes her life here), and also director of Linen Press, a small publishing company for women authors. If you like "original, beautifully crafted books that speak directly to women" check them out. I particularly like the sound of 'The Making of Her' by BAFTA winning writer Susie Nott-Bower, and 'Nothing is Heavy' by Vicky Jarrett. We were not numerous, and I was glad we'd gone because we added 100% to the numbers and spent a very enjoyable hour or so. It was a shame that there were not more people because Lynn is an excellent speaker, she's a lovely person and her book sounds fascinating. It's set in Kenya during the Mau Mau uprising which Lynn experienced first hand when she was young, and sounds absolutely terrifying. "By 1950, Kenya was on the verge of one of the bloodiest wars of decolonisation fought in Britain’s twentieth century empire.’ Britain’s Gulag. White Lies is about different kinds of war and different kinds of loving. It explores the fragility and partiality of memory and our need to re-write the past so that it does not jar with the stories we tell ourselves and others." Lynn also spoke about her experiences as a publisher, and told us, rather worryingly, that many books are now being published without editing. Editing is an expensive, time-consuming business, and publishers are bypassing this important step to get their books out faster and cheaper. Look out for a free-fall in quality in the near future! After we left Le Bookshop, we made our way back to rue St Guilhem and into a kitchen shop where I found the niftiest scissors ever. 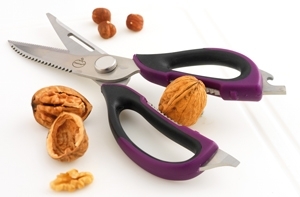 I couldn't resist these multi-function kitchen scissors which cut and peel, has tools to open cans and beer bottles, can crack nuts, zest and even act as a screw-driver. It also comes with a magnetic holder which I've put on my dish washer so I can whip out the scissors as and when, like drawing a gun. BANG CUT WALLOP! I just hope they last longer than my last 'good quality' scissors (2 months).